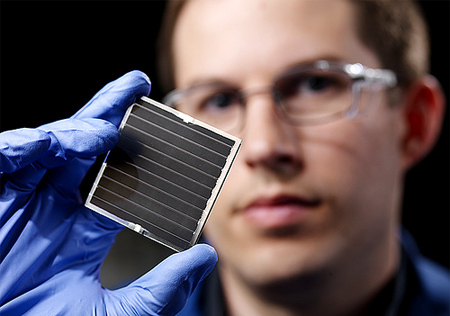 You want to understand solar cells? We’d better begin with the photovoltaic effect. Nearly two hundred years ago, Becquerel showed that certain materials acquire an electric charge when they’re exposed to sunlight — some negative (N), some positive (P). Nowadays, we’d call those materials semiconductors. Semiconductors were the big electronics story of the last century. You can do all kinds of interesting things with them, but we’ll concentrate on photovoltaics. You make a photovoltaic cell by joining the two semiconductor types, P and N. Thin, flat layers will catch all the available light. In bright sunlight, the electrons in the N-type layer get excited. (That’s a technical term.) They stream towards the positive charge in the P-type layer. Wire the layers up right, and you can harvest current. Photovoltaic effects are weak, so you need big layers to get a measurable output. A few square inches is pretty much the biggest size you can reliably make with current technology, and that sets the size of the cell. Hook up two cells, one after the other, and you double the output. Hook up fifty and… you get the idea. A solar panel is just fifty or a hundred cells in a neat steel-and-glass box. Cells come in two main types: crystalline and thin film. Both have advantages and disadvantages. 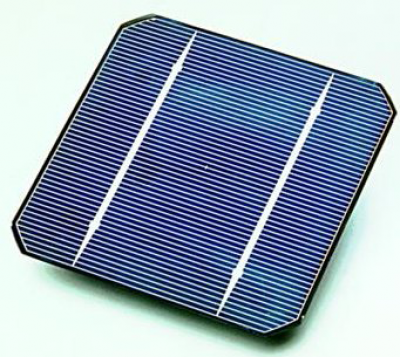 Crystal cells are made from wafers of mono- or polycrystalline silicon. Monocrystalline cells offer peak efficiency, but they’re brittle and relatively difficult to manufacture. Polycrystalline cells are still pretty efficient, but easier to make. They’re the ones you find most often in domestic solar panels, protected between layers of glass and metal. Thin film cells are made by painting a substrate with layers of semiconductor. Current favourites are amorphuous silicon, cadmium telluride or copper indium selenide. Thin film cells are durable and easy to manufacture, but inefficient by comparison with crystalline. Thin film cells are the ones you’ll find on solar backpacks and cheap walkway lighting. There are some more exotic designs out there. In fact, new cells are coming onto the market all the time, and older designs are being refined. Modern cells yield better than those of a decade ago, but next decade they’ll be better still. These are exciting times for solar power.